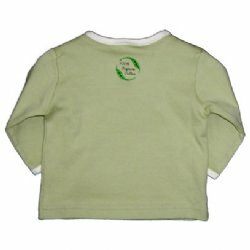 BabyNaturopathics.com - Organic Cotton Baby T-Shirt With Elephant Family Embroidery By Baby Naturopathics - Baby Naturopathics Inc. Pretty cute, if we say so ourselves. 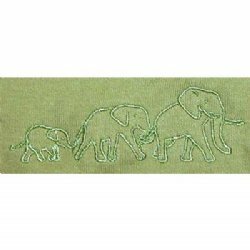 The elephant border is embroidered and runs along the bottom of the front of the T-shirt. 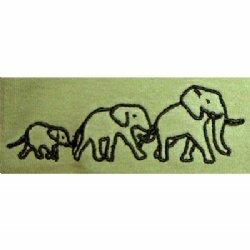 The border depicts an elephant family consisting of a papa elephant, a mama elephant and a baby elephant. This tee is colored using organic dyes, and is trimmed with undyed organic cotton. The elephants border consists of three separate elephant families. The middle family is embroidered in a lighter, contrasting color. The colors of the 'Elephant Walk' is customized for each t-shirt color. All our tees and kimonos also have our 'organic cotton' leaves logo embroidered in the back. Green Tea is a light-medium green. This baby t-shirt is SKAL certified.